Terralina Crafted Italian restaurant opened at Disney Springs on June 28. AllEars.Net&apos;s Deb Koma stopped in the other day for a quick look around and sampled a few menu items. On June 28, James Beard Award-winning Chef Tony Mantuano will debut his newest dining concept, Terralina Crafted Italian. Set along the shores of Lake Buena Vista, Terralina Crafted Italian was inspired by the design and lifestyle of Northern Italy&apos;s famous lakes like Lake Como, set far away from city life and surrounded by picturesque villages. Patina Restaurant Group (PRG) opened the doors on Jan. 4 for a media preview and soft opening that showcased the stunning new Italian restaurant located at the reimagined Disney Springs at Walt Disney World Resort -- Maria and Enzo&apos;s Ristorante. 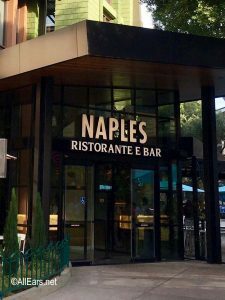 The Levy Restaurant group, which debuted Paddlefish, a seafood-centric signature restaurant located in the heart of Disney Springs earlier this year, will soon unveil their newest venue: Terralina Crafted Italian, expected to transport guests to "la dolce vita," (the sweet life) essence of the spectacular Lake District of Northern Italy. The restaurant was originally to open in Fall 2017, but has been delayed until Spring 2018. A new Italian restaurant, Terralina Crafted Italian, is slated to open this fall at Disney Springs on the site of the former Portobello Country Italian Trattoria. James Beard Award-winning Chef Tony Mantuano will curate the new menu, and Chef Justin Plank will return from Portobello to run the kitchen. Levy Restaurants, a Chicago-based restaurant company which operates more than 100 food-service locations in the United States and Canada, is excited to announce the development of a new, Italian restaurant concept at Disney Springs. James Beard award-winner and Top Chef Master, Tony Mantuano, is leading the development of the restaurant, which will replace the space at Disney Springs currently occupied by Portobello Country Italian Trattoria. The new restaurant&apos;s menu will feature dishes inspired by Chef Tony&apos;s adventures across the many regions of Italy. In order to accommodate the large-scale renovations, Portobello closed its doors April 24, 2017, with plans for the new concept to reopen in early Fall 2017. Today Disney shares the costume designer renderings of the costumes for the cast members. These were designed by Walt Disney Imagineer Celina Lung. Lung has also designed costumes for Epcot&apos;s Coral Reef restaurant as well as various locations in Disney parks around the world.